Over the past few months, a small field team has been based within the Perth Valley project area. They have been establishing temporary routes to allow ease of access for ZIP staff in the project area. These routes are well below the standard of a traditional tramping track. Three temporary bivvies are being built (in Oamaru) to provide accommodation for the field team. Once completed, the bivvies will be transported to Whataroa, and then heli-lifted onto their foundations (which are already installed), most likely during mid-May. Satellite-based internet has been installed and working at Scone Hut, for research purposes, and will be installed at each of the three temporary bivvies. A very high frequency radio repeater has been installed which now provides reliable radio communication across the research area for the team. A predator gate has been installed on the Scone River swing-bridge to block possums, rats and stoats from accessing the project area. This gate is never locked and does not prevent access by people. DOC and the Medical Officer of Health (MOH) have recently granted ZIP permission to apply aerial 1080 at this site. The treatment area covers approx. 7,500ha. The area to be treated includes alpine shrublands and tussocklands, because this is habitat for possums, stoats and rats. One of our field team recently took the video below of a stoat with a rat in its mouth in this habitat. We anticipate that this operation will result in the complete removal of possums, and maybe even rats, from the research area. (Stoats are also expected to be greatly reduced; the full extent of that is less predictable and will be the subject of research). If the 1080 to Zero treatment is successful, and we also successfully develop techniques to prevent possum and rat invaders from re-establishing, then the large-scale repeated application of aerial 1080 may no longer be necessary at this site (and could well be deployed at similar sites throughout New Zealand). You can read more about our previous work to develop the 1080 to Zero prescription here. The research programme also includes work to investigate the impacts, if any, of the 1080 to Zero treatment on four non-target species: kea, whio, rock wren, and tahr. We have fitted 29 kea within the project area with radio transmitters that alert staff if a transmitter has not moved for over 24 hours (indicating potential death of the animal wearing it). The kea will be monitored using Sky Ranger, a receiver mounted within a fixed wing aircraft, after each application of bait (i.e. pre-feed and the toxin). As part of the work to fit kea with radio transmitters, we discovered that rock wrens are present in the research area in relatively large numbers compared to other similar sites. With the assistance of DOC staff, we have started to visually survey rock wren numbers in selected parts of the alpine zone both within and outside the aerial baiting area. These surveys will be repeated after each of the two applications of the toxic bait (snow level allowing). Sections of the Barlow, Perth and Scone Rivers, and the Bettison Stream will be surveyed by field rangers for the presence of whio. This survey will occur before the first toxic baiting, and after each toxin application to determine presence or absence of the birds. Radio tags cannot be used in this instance, as the rivers in which the whio live are too dangerous for staff to access to catch and handle the ducks. A monitoring plan has been developed by the Game Animal Council, in association with ZIP, New Zealand Deerstalker Association, Professional Hunting Guides Association, and DOC. A Game Animal Council-led team recently spent one day in the research area, with helicopter support, and attached collars containing radio transmitters to 21 tahr (made up of nannies and young males). These will also be monitored using Sky Ranger (at the same time as kea are monitored). In November 2017 we reported on the results of a trial to determine whether a relatively small river is an effective barrier to possum migration. We are now running a trial to determine the effectiveness of the Perth River as a natural barrier for rats. 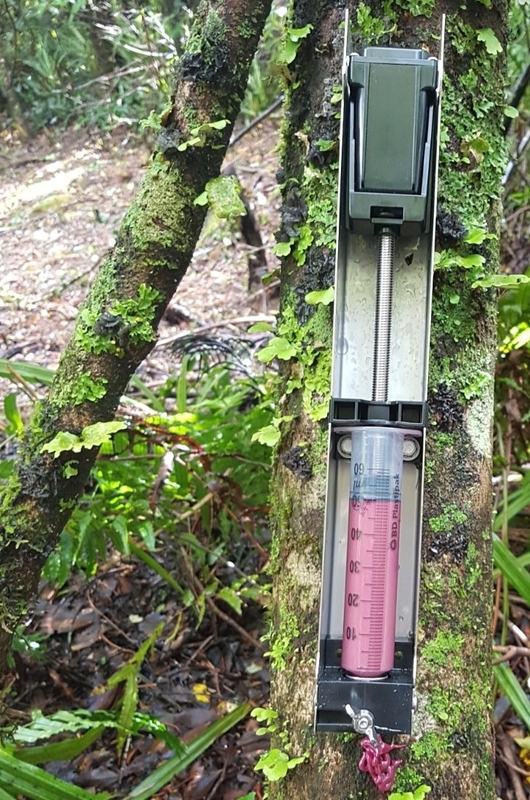 ZIP-designed automated lure dispensers, filled with Rhodamine B biomarker-laced peanut butter or ‘egg mayo’ (by Connovation) have been deployed along a 3.2km stretch of the river’s edge outside the research area (i.e. the true left side of the river). Kill traps have been deployed along the corresponding river edge inside the project area (the true right side). The rats caught in those traps after the first toxin application will be examined for presence of the biomarker; if it is found, then this will indicate that the rat(s) crossed the river. We are currently using tracking tunnels, wax tags and trail cameras to detect and measure possum, rat and stoat numbers at 12 separate sites in the research area. In order to determine success of the 1080 to Zero treatment, these tunnels, and cameras will be reinforced with chew cards deployed every 10m along approximately 25 detection lines that are 700m apart from the valley floor to the alpine zone throughout the research area. Surviving predators, in the absence of others (i.e. 'lonely survivors'), are known to roam widely as they presumably look for mates – as such, we expect this network of devices to detect those mobile individuals. For rats, this network is expected to be able to detect any survivors and their first offspring within 15 weeks of the network being deployed (with 90+% confidence). We do not expect to be able to reach a final conclusion about the success of the 1080 to Zero treatment until November 2018 at the earliest (weather dependent). Assuming the treatment is successful, the research focus will move to protecting the project area from reinvasion. The detection grid for this is expected to comprise of self-reporting traps (i.e. a trap that automatically informs our field team if it is sprung) deployed every 100m along the same detection lines referred to above. This self-reporting function is vital for the long-term management of this trap network over such a large project area. For further information, please contact us at info@zip.org.nz.